My lovely friends, Anastasia of Olive Photography and Joanne over at June Bloom Events, invited me to join them for this epically romantic shoot at Chudleigh’s Apple Orchard last summer. Since then, it has been featured on a few of my favourite wedding blogs… twice! I can’t believe I haven’t shared this gem yet! Joanne artfully conceived and organized the shoot – and good glory was all her hard work the effort worth it. The modern geometric inspiration, mixed metallic accents and romantic yet striking colour palette, come together under branches in a moonlit apple orchard. I was so excited to experiment with a modern, geometric twist on the garden-style aesthetic. The powder pink king protea reflects the clean lines and architectural shape of the vessel. Elegant spires of foxglove, soft billows of mock orange and reaching stems of clematis soften the protea and add a romantic touch. See the below for a full list of all the incredible vendors involved. 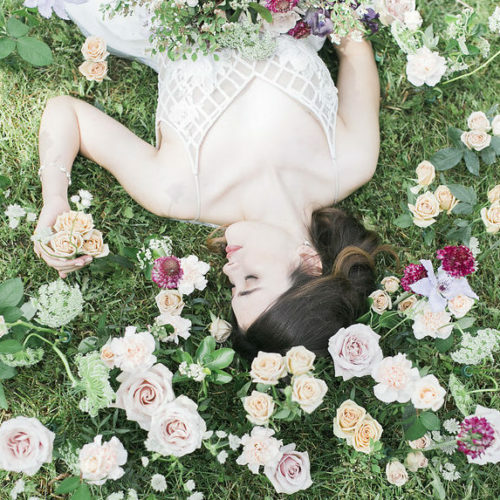 I am so happy to have this shoot featured by both Junebug Weddings and The Wedding Co.